Summary: A special edition to commemorate the tenth anniversary of Sue Monk Kidd's multimillion-copy bestseller. I can hardly believe it! THE SECRET LIFE OF BEES is ten years old! I read this book when it first came out and again for my book club a few years later, and I still remember it like it was yesterday. I consider THE SECRET LIFE OF BEES to be one of my all-time favorite books and I'm thinking that it's almost time to share it with Booking Daughter. 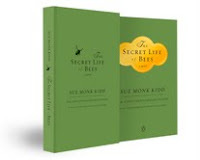 To mark the tenth anniversary of award-winning author Sue Monk Kidd’s debut novel, Penguin is offering a special edition of THE SECRET LIFE OF BEES. Included in this book are "Sue Monk Kidd’s intimate reflections on conceiving and writing the novel and on the effect its vast community of readers has had on her life. This new and gorgeous edition of an extraordinary, powerful story will be a keepsake women will share and pass on to their daughters for years to come." I think this book makes a perfect gift for a special woman in your life... or even yourself. To celebrate the release of the Tenth Anniversary of THE SECRET LIFE OF BEES, Sue Monk Kidd has put together a very interesting Q&A based on ten questions from her Twitter followers. 1. Why did you feel the need to write a romantic portion in The Secret Life of Bee? In your imagination, did anything ever come of that? I could answer that I put everything into Bees but the kitchen sink, that is, everything the story could naturally hold—coming of age, the mother-daughter bond, race, sisterhood, the feminine divine, death, abandonment, forgiveness, the search for belonging—so why not a little romance, as well? But I did have a larger reason. Lily’s experience of ‘first love’ with Zach is in the story because she’s white and he’s black. The novel is set in 1964. I was about Lily’s age at the time, and where I lived, interracial romance was as taboo as it got. Putting that taboo into the novel gave me yet another way to explore the complex history of racial divide. And hopefully, it gave the reader another way to experience the pain of racial separation and cruelty. There’s a scene in the book in which Lily and Zach wrap their arms around each. What happens next is best described by Lily: “He unwound his arms and said, ‘Lily, I like you better than any girl I’ve ever known, but you have to understand, there are people who would kill boys like me for even looking at girls like you.’ “ He was right. In the end, I agree with novelist Margaret Atwood who said, “Good writing takes place at intersections, at what you might call knots, at places where the society is snarled or knotted up.” Lily’s and Zach’s romance is one of those knots. The question also asks whether anything ever came of Lily and Zach’s romance in my imagination. Surprisingly it did, but I’ll get to that in my answer to question 8. 2. What has surprised you the most about how people responded to The Secret Life of Bees? Did you expect it to be so popular? Beside the fact that so many people responded, I would say my biggest surprise has been the diversity of the book’s readers. It is read by 90 year olds and 12 year olds, by women and men, by Americans, Chinese, Brazilians, Germans, as well as people who speak 32 other languages. I couldn’t have imagined it in a million years. When the novel was first published, I had three pragmatic hopes: first, that the book would find a modicum of respect in the literary world; second, that my publisher had not been overly optimistic in commissioning a first printing of 68,000 copies; and third, that my family and friends, who might possibly number as many as 500, if I really stretched it, would read my book along with 67,500 other people who were not related to me and who had no idea who I was. In my mind, these seemed to be very large hopes. After all, Bees was a debut novel by an unknown author. Indeed, early on, some of my events drew so few people they might have been canceled were it not for store employees who rallied from behind the counters to fill seats. Gradually, however, actual customers showed up, and a quaint and vintage form of social networking called Word-of-Mouth kicked in, slower than Electronic Virus, but like the Pony Express, very reliable. Thanks to the goodness of readers, my pragmatic hopes were eventually realized, and then some. Today, no one feels more incredulous about the novel’s popularity than I. The only proper response is gratitude, and that I feel every day. 3. Have you ever been to a church service like the one at the Boatwright's house? If so, where? I want to go. In The Secret Life of Bees, August refers to her religious affiliation as “Orthodox Eclectic.” Lily is not sure what it is, only that it’s not like the Baptists and Methodists. As Lily says, “We didn’t have many Orthodox Eclectics back in Sylvan.” The church service that the sisters held in the pink house is an eclectic blend, for sure. It’s a fusion of black politics, old time gospel religion, Catholicism, and feminine spirituality. To answer your question: No, I’ve never attended a service like that. It all sprang from my imagination, but I suspect I was creating something I’d like to attend. The service was organized around the icon of a Black Madonna. She had an oral history that could be traced back to the time of slavery, so naturally her story is recited during the service. That is followed by a conga line. I’m not sure why, except the women felt a lot of exuberance hearing the story and needed to get up and dance. The service also includes a ritual in which the women press their hands to the Black Madonna’s heart. Her icon embodies ideals of feminine strength, power, autonomy, love, and consolation, and by touching her heart, the women are connecting with these qualities in themselves. I should also mention the service featured big hats. Again, that may be because I’ve always wanted to attend a service where everybody wore elaborate hats, kind of like a royal wedding. 4.How did you come up with the names for the sisters? I named one of the sisters August for the unremarkable reason that I’d always wanted to give that name to a character. With her named, I then began to try out names for the other two sisters. Everything I came up with sounded wrong. Their proposed names seemed too mundane, or too forgettable, or too incompatible with the era and the culture, etc. Then one day, I happened to hear my mother refer to my three great aunts: Aunt Rose, Aunt Lily, and Aunt Violet. I immediately knew the Boatwright sisters would have a similar sort of threefold naming. But not flowers, months. Thus, came August, May, and June. 5. What was your inspiration for the book? When I was growing up, bees lived inside a wall of our house— an entire hive-full of them, that is to say, 50,000 or so. They lived with us, not for a summer, but for eighteen years. Occasionally, they squeezed through cracks in the wall and flew about. My mother, genius that she is, turned the room into a guest bedroom. Over the years, I more or less forgot about the bees, until one evening when my husband, Sandy told our dinner guests about the first time he visited my home and was put in the guest bedroom. He was awakened in the middle of the night to find bees flying about the room. His telling of this rather unique part of my family history coincided with a new desire I harbored to write fiction. I began to picture a girl lying in bed, while bees slipped through crevices in her bedroom wall and flew laps around the room. The image stuck in my head. It caused me to ask: Who is this girl? What does she want as she lies there, watching the bees fly around? I decided the character in my head was a 14 year old motherless girl named Lily Owens. What she wanted was her mother, along with all a mother might imply, namely love and home. So, we could say the book was inspired by a memory, that turned into an image, that sparked questions I felt compelled to answer. 6. Why did Lily never tell August about the bees in her room at the peach farm? And who placed the paper bag in the attic? In ten years, I’ve not been asked either of these questions. In fact, I don’t even know the answer to the first one. Why didn’t Lily tell August about the bees in her room on the peach farm? I have no idea—it just never occurred to me. I’m suddenly thinking this could’ve been an oversight. Where were you, asker, when I was writing this? I could have used a prompt back then. Who placed the paper bag in the attic? Fortunately, I did think of this. I did not spell out the answer in the story because I liked the subtlety of inference. In my mind, it was T.Ray, Lily’s father, who placed the bag containing his wife’s possessions in the attic. He was both wounded and embittered by her leaving, and while he had wiped out all traces of Lily’s mother in the house, he couldn’t quite throw these last remnants of her away: her white gloves, a photograph of her leaning against a car fender, and the wooden picture of black Mary that would lead Lily to the Boatwright sisters. 7. Are any of the Boatwright sisters modeled after people you know or have met in your own life? I did not model August or May or June on any one individual person, but I was drawing on recollections of growing up in the fifties and sixties around a number of African American women in Georgia. No doubt I borrowed some traits and qualities from these women, along with their manner of talking. Each Boatwright sister, then, may possess a small mix of features from numerous women, but they also possess features that spring straight from my imagination. Most characters are a combination of conjuring and remembering. 8. Will there be a sequel for your amazing book which my class is currently reading, The Secret Life of Bees? When I finished the book, I was sure that I would never revisit the story. I didn’t want to risk tampering with the world I’d created. I felt that way for years. Then in 2008, while watching the film adaptation of Bees of the first time, I had a kind of moment. It came during a scene near the end in which Zach gives Lily his dog tag and they share a first kiss. The dialogue is very close to that in the book: “We can’t be together now,” Zach says, “but one day, after I’ve gone away and become somebody, I’m gonna find you, and we’ll be together then.” Watching this, I really wanted to know how that might play out. How would things turn out for these two? I would still like to know. So, maybe I’ll just write it one of these days. 9. Lily was made to kneel on grits. Did this ever happen to you? How much of the story is autobiographical? The book had not been out very long when I discovered that some readers hold to the idea that when a novelist writes fiction, she is writing surreptitiously about her own life. During the last ten years, countless strangers have consoled me on my wretched childhood. For the record, my childhood was not like Lily’s. Unlike her, my mother did not die when I was four. She is alive, well, and living in Georgia. At no time did she desert me. Indeed, she was once presented a Mother of the Year award. Likewise, my father is nothing like T.Ray. He, too, is alive and well in Georgia and no doubt wants me to make it abundantly clear that he never once forced me kneel on grits, and that he is well aware Shakespeare’s first name is not Julius. I can further attest that I did not break anyone out of jail or ever run away from home. Now, to muddy the water: Lily and I do have similarities. We both grew up in houses with bees in the wall. We both come from tiny Southern towns. And there are other small resemblances, too, but while Lily’s life is a little like mine around the edges, at heart, it is nothing like mine. 10. In Traveling with Pomegranates we got a glimpse into your Bees writing process. Which piece of the storyline was most challenging to write? There really wasn’t a particular story line in Bees that was harder to write than another. If I had to choose one, I might say the most challenging story line was Lily’s relationship with her father, T. Ray. I do know this, however: the hardest part of Bees to write was the beginning. There was just so much to be accomplished in a short space of time, and it must not look as if you’re trying to accomplish anything. In the opening of Bees, I was trying to introduce Lily, reveal her character and motivation, set up the problems and agendas of the story, and describe the setting, all while keeping the action and plot moving along. The first 30-40 pages took me a disproportionate amount of time to write compared to the rest of the book. The beginning was the uphill part. Then there was a long plateau in the middle. And the end was the downhill part. Saying that my ending went “downhill” could be a poor choice of words, but you know what I mean. Giveaway alert: I have a copy of The Tenth Anniversary Edition of THE SECRET LIFE OF BEES to share with one lucky reader. To enter, just fill out the form below before Friday, December 15th at 11:59 p.m. ET. I will randomly select and notify the winner the following day. This contest is open to those of you with U.S. addresses only. Good Luck! What happened to answer number three? I read every word of this Q&A because just yesterday I included Sue Monk Kidd as one of the twelve authors I'd like to have at my Thanksgiving table. Sue Monk Kidd came to our local library last year and she was just fascinating! She's funny and smart and a great speaker. This is a fantastic giveaway! Very interesting Q&A. And ten years! wow, who would have thought! I've read the book 4 times so far - and I loved the movie too!! I have been teaching this book in my AP class for the past 6 years!! LOVE IT! So do my students! What a great giveaway and oh wow! has it really been TEN years? I remember that book club meeting just like it was yesterday and the biscuits with honey we had to go along with the fantastic conversation. Love this interview and author! I'm kicking myself that I haven't read this book yet, but hoping I'll win of course. ;) I've got an old used copy on my shelf that I picked up from a book sale at some point.